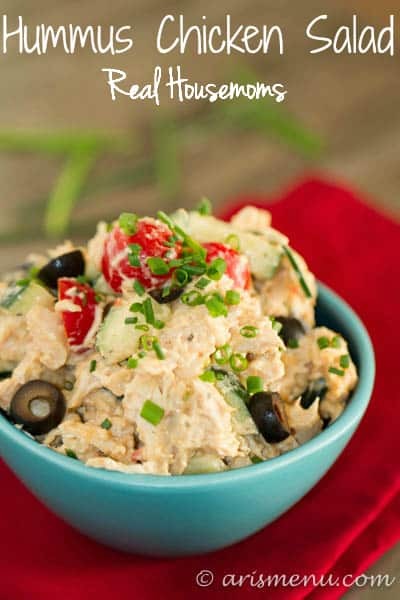 Easy, healthy and delicious chicken salad held together by HUMMUS instead of mayo! Packed with lots of veggies for a perfect make ahead lunch or easy dinner. One time I tried to make my own hummus. It was so annoying because I was all “OMG must make it healthier! NO OLIVE OIL!” It was stupid because, ummm, hummus needs olive oil. It’s, like, a scientific fact. 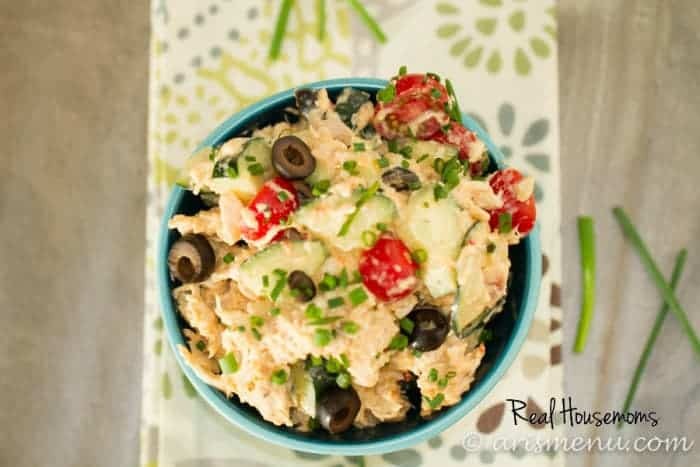 I can tell you this because I proved it with my overly thick and not spreadable hummus that not only looked terrible in pictures, but definitely was not delicious enough to post on my blog. You’re welcome. I’ve been meaning to try again ever since, but I just keep buying it at the store. Whenever I do, it lasts approximately 48 hours. And so does the bag of baby carrots I buy with it. I could literally dip veggies into hummus all day long and never get tired of it. Is that weird? 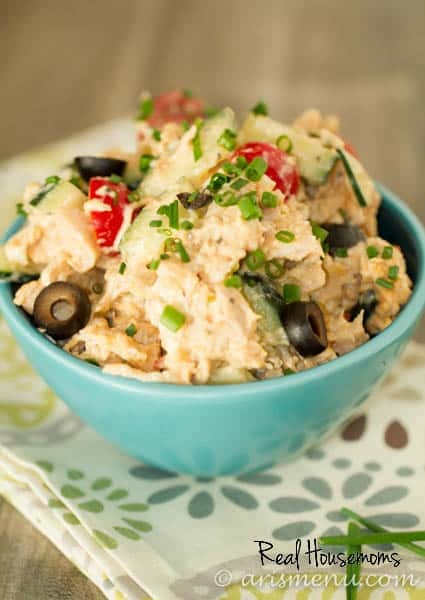 One of my favorite things to do is make new and creative chicken salad recipes. First of all, it’s ridiculously easy, and second of all, I make them in bulk, and then have lunch to take to work with me all week long. I know, one thing for the whole week…I am a creature of habit. But it lasts long enough that you can skip a day or two, or just make it for the whole family, and it’ll probably be gone in 24 hours! 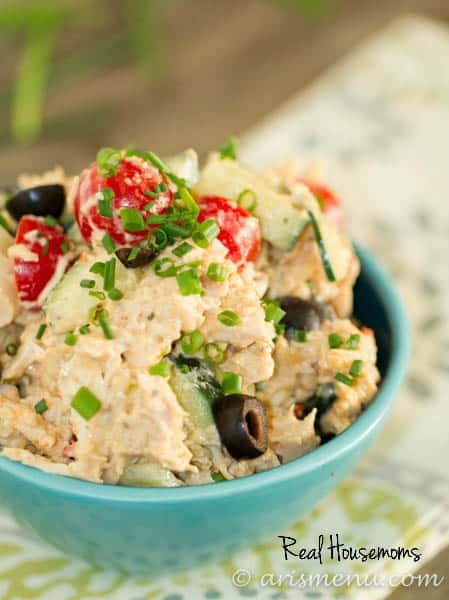 The recipe is super simple and customizable–use whatever kind of hummus you like. Don’t like olives? I don’t understand you, but you can leave them out. Love veggies? Add some extras! It’s totally up to you. Plus since it comes together in minutes, you have plenty of time to try out all your favorite variations! Combine all ingredients together in a large bowl. Refrigerate in an airtight container for 5-7 days. This looks absolutely fabulous! What a great meal idea! Yum! What a great idea. I love hummus as well. Thanks for sharing!